Forgot Something? Airport Vending Machines Can Help! We have nothing against Cheetos and soda, but we prefer our vending machines stocked with wholesome treats and handy products—especially when we’re on the road. Automatic kiosks at airports, which began popping up in hubs around the world in the late 2000s and have since become quite common, offer an array of useful products available at the push of a button. It’s an interesting concept: Travelers can feel less frantic about forgetting to pack some essential thing because they know that a vending machine will readily dispense a phone charger or some mascara. And the kiosks, for the most part, stay open around the clock. Here are seven awesome airport vending machines that could prove quite convenient on your next trip. 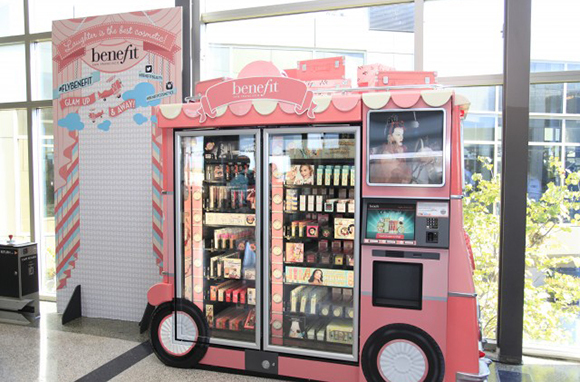 Benefit Cosmetics has set up what it calls "beauty kiosks," (a clever marketing name that sounds a lot fancier than "vending machines") in some U.S. airports. In terminals in at least 10 airports across the country, you'll find 30 of the brand's most popular products, including cover-up and mascara, for sale in cute soft-pink machines designed to look like girly little buses, wheels and all. The cosmetics company plans to install a total of 25 machines in U.S. airports by the end of the year, which is really good news for those of us cursed with puffy raccoon eyes and pallid skin after long hours in a plane. Billed as "the world's first fully automated convenience store," Shop24's massive machines dispense as many as 200 different products weighing up to eight pounds each. It's definitely not the kind of machine you can shake when the Twix bar gets stuck. You'll find Shop24 booths in all kinds of places—from college campuses to bus stations—including airports, of course. The enormous Shop24 in Dallas/Fort Worth's Terminal A sells souvenirs, snacks, drinks, travel neck pillows, toiletries, and more. Since the machine is open 24 hours a day (hence the name), it's your one-stop shop for anything you might need before that red-eye out of Dallas. I spotted this vending machine, which serves espresso drinks, tea, hot chocolate, and soup, in Terminal E in Zurich Airport (after airport security). Is coffee from a vending machine any good? It was decent—but quality is beside the point. The most awesome thing about this machine is the affordability of its offerings. Get an automated caffeine fix for nearly half the price of the coffee and espresso drinks for sale in the airport's very expensive cafes and restaurants. (This is Switzerland, after all.) Affordable espresso is especially ideal when you're waiting to board and not really sure if there will be enough time to finish a drink. 3Floz kiosks are stocked with (TSA-approved!) travel-size beauty essentials like face wash, toothpaste, moisturizer, and sunscreen. A mix of more than 50 high-end as well as popular and affordable brands like Malin + Goetz, Burt's Bees, and Klorane are sold in the machines, located in six U.S. airports. If you forgot to pack your favorite lip balm or lotion, there's no need to succumb to overwhelming panic and horror, because it's a safe bet you'll find a similar product—if not your exact favorite—in a 3Floz kiosk. One product we love that's for sale in 3Floz machines is You Smell Paper Soap, a moisturizing "hand-sanitizer alternative" formulated in thin paper sheets, which comes in scents like lemon and "divine." (The paper dissolves into a rich lather upon contact with water.) This sweetly scented paper soap is worlds better than the viscous, medicinal-smelling gel in the airplane bathroom. Good news, everyone. 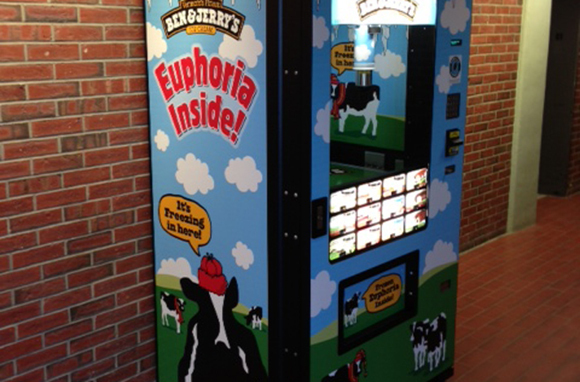 Ben & Jerry's has vending machines. And you can find them in airports, although, admittedly, they're few and far between. According to Joseph Beaudette of Scoopless Ventures (the company that makes Ben & Jerry's vending machines and pushcarts), there's one in the New Bedford Regional Airport in Massachusetts. If you miss your connection to Cape Cod, at least you can quell your tears with a pint of Cherry Garcia. And in the Midwest, handmade meets high tech: Buy a favorite hometown treat from an automated machine at Ohio's Port Columbus International. The airport has three kiosks selling various flavors of Jeni's Splendid Ice Creams, a local handmade ice cream brand that was founded in Columbus. Swipe your card to grab a scoop or a sandwich (ice cream, of course) in Concourses A, B, and C, and chow down on wholesome ice cream made from grass-fed cows in the Buckeye State. Zoom Systems, the vending-machine company that brings us several of the kiosks on this list (Benefit Cosmetics, 3Floz, and Max-Wellness) is responsible for the popular Best Buy Express vending machines that you've likely seen at some airports during your travels. The retail systems were first rolled out in 2008 and are arguably some of the most ubiquitous airport vending machines around. According to Zoom Systems, there are more than 100 of the kiosks stationed around the U.S. Behind their clear windows, the machines display headphones, smartphones, chargers, cameras, and other devices, and the products are sold for the same prices you'd see in a Best Buy store. Whether you're in the market for a big-ticket gadget or not, Best Buy Express kiosks certainly come in handy when you've forgotten your phone charger at home. Have you come across an interesting or awesome airport vending machine? Tell us about it!